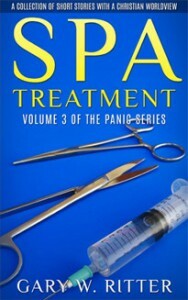 Spa Treatment is the third of three books in The Panic series, each of which contains a collection of twenty short stories. In the first two books of the series all stories were written in response to a Christian writing challenge contest. This book differs in that the second half contains stories that weren’t part of the writing challenge. All were written during the same year, but some of the non-challenge stories are slightly longer and don’t adhere to a challenge topic as all the others do. As with all the books in this series the stories provide an eclectic range of fiction from drama, suspense, humor, social and political commentary, to take-offs on Biblical stories. I hung up the phone singing a little tune to myself. Everything was good; soon it would be even better. Looking in the mirror I saw the outline of my firm body, the good looks I’d inherited from my mother. I tossed back my hair and ran my hands over my breasts, stomach, and hips. Curves in just the right places. You go, girl! Yep, things were good, and I could go to the spa knowing I’d come out ready to party. In the car I slipped on my sunglasses and headed to my destination. The block around the building had no parking and I had to find a place some distance away. No problem. I liked to walk. I made my way up the sidewalk and saw the sign beckoning above the front door: “PP Beautiful You Spa,” and headed toward it. I couldn’t wait.